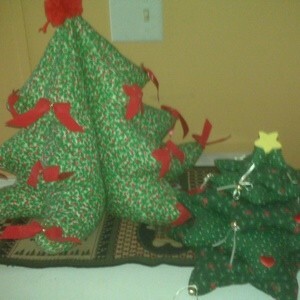 I love the fabric, handmade Christmas trees. I buy them at thrift stores. I decided to make some, but I can't find a pattern. Does anyone have the directions? There are 2 kinds; one looks like stacked stars and the other is shaped like a tree, 3 points on each section. Here are the pictures of them. The star one seems like it would be easy to fake with several graduating size stuffed stars stacked together. Take a 5 pt star shape to a copy store and have them enlarge it to 5 or more sizes increasingly larger. Thanks so much Kaelle! I did some searching online before but came up empty handed. Thanks again and Merry Christmas!